Thank you for your interest in volunteering for Woodland Park Zoo’s Jungle Party. We have completed our 2018 recruitment for all volunteer positions. Check back next spring for information on 2019 volunteer recruitment. Why Are Volunteers the Backbone of Jungle Party? The first Jungle Party was organized by a small group of Junior League volunteers 43 years ago, and the event raised more than $1,500 for zoo operations. Today, more than 300 volunteers generously donate over 3,700 hours to Jungle Party. Volunteers comprise Jungle Party’s Executive Committee, Auction Procurement Team and Operation Crews. The wide range of duties include fundraising, strategic planning, auction item procurement, production/auction support and administrative assistance. Jungle Party is Woodland Park Zoo’s annual fundraising event and auction. Proceeds help support exemplarily animal care, extraordinary experiences that spark a deeper sense of understanding and empathy, and innovative field conservation programs in the Pacific Northwest and around the globe to save species and their ecosystems. Friday, July 12, 2019 at Woodland Park Zoo's North Meadow. Please enter and exit via the South Entrance. There will be a volunteer training for all Jungle Party volunteers on Thursday, June 27 from 6:00 – 8:00 p.m. Learn your position, meet your Team Captain and interact with your team members! This is mandatory; even if you are a returning volunteer, you must attend this training to volunteer the night of Jungle Party. On July 12, 2019, volunteers may park and enter via the Hippo Lot/South Entrance at the intersection of North 50th Street & Fremont Ave North after 3 p.m. The Penguin, Otter and Bear parking lots will be CLOSED for volunteer parking on the day of Jungle Party. Please arrive at the zoo 30 minutes before your job assignment is scheduled to begin, unless otherwise instructed. Proceed to check in at Volunteer Central, located in Zoomazium. Your belongings may be stored there, but please leave valuable items at home, for this is not a secure area. Upon completion of your volunteer assignment, please check out at Volunteer Central. Volunteers receive a complimentary t-shirt, which is to be worn at the event. Please do not alter your t-shirt until after the event. Volunteer t-shirts are handed out at Volunteer Training. Please request your t-shirt size on the Volunteer Registration Form. Volunteers are asked to wear the Jungle Party Volunteer t-shirt, black or khaki bottoms and very comfortable shoes. Volunteers receive one dinner ticket, which is redeemable for the volunteer meal provided at Zoomazium. Unlimited water and non-alcoholic beverages will also be available at this location throughout the event. Please note that alcohol bars, latte cart and patron food are for guests only. Jungle Party volunteers must be at least 21 years old and must refrain from drinking alcohol, smoking, and eating the guests’ food while volunteering at Jungle Party. This will be strictly enforced, and breaking these rules will jeopardize one’s ability to participate in future Jungle Party events. 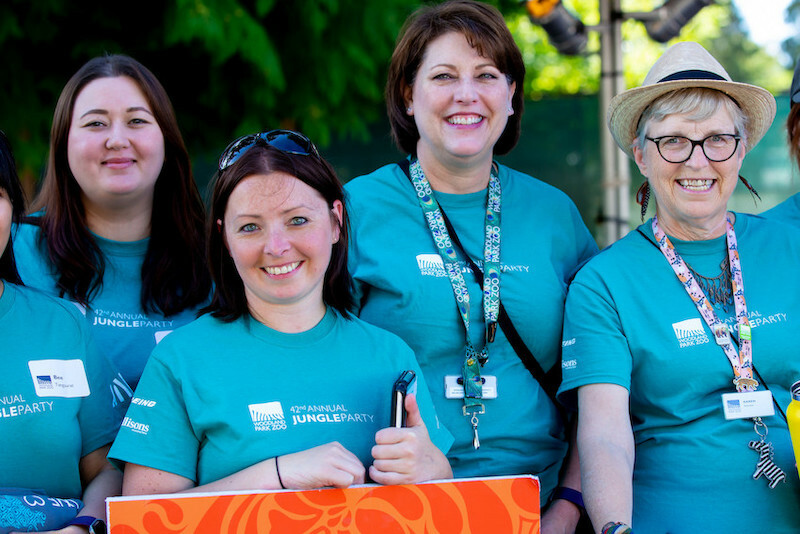 We ask that all volunteers be able to attend the Jungle Party Volunteer Training on Thursday, June 27 and fulfill their volunteer position commitment on Friday, July 12. Jungle Party volunteers must also be able to interact professionally with and provide excellent customer service to Jungle Party guests, staff and fellow volunteers. Please be extremely reliable and dependable and able to work cooperatively as part of a team. The willingness and ability to follow directions is a requirement as well. With a large event like Jungle Party, it is also important that volunteers are flexible and willing to adapt to changes as needed. **Volunteers in all positions must be willing to learn Jungle Party facts because guests will inevitably ask them questions while performing this job. Sample questions are… What time does Bank open for checkout? Can someone assist us with our auction items to the car? Who is the caterer? Where are the restrooms? All of this information will be provided at volunteer training. Please check back soon for job descriptions and registration information!